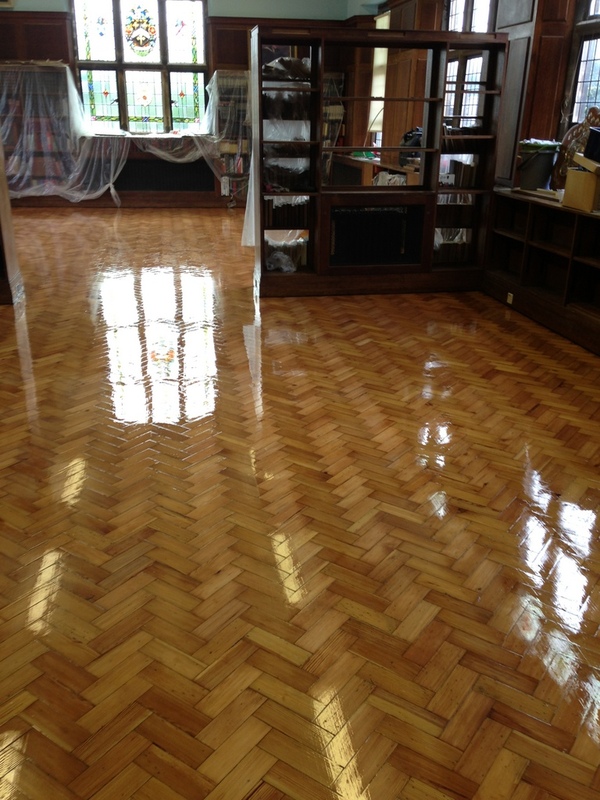 Village Hall Floor Refurbishment by Floorcare Services. 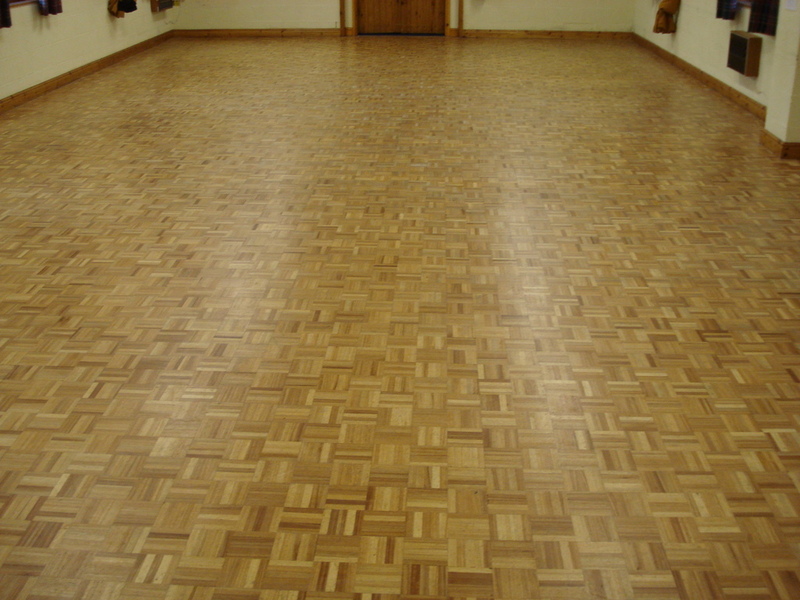 Hardwood Mosaics Floor Cleaned, Abraded and Re-sealed at Hognaston Village Hall, Derbyshire. Mosaics Wood Flooring Chemically striped to remove marks and stains and Re-sealed with 2 Coats of Hard Wearing Polyurethane Seal by Floorcare Services. Floorcare Services are Wood Flooring specialists and completed this 98 sqm job in 1 day with following day to final coat only. The Line / Court Marking of any New indoor court, Any Size, Any Colour. 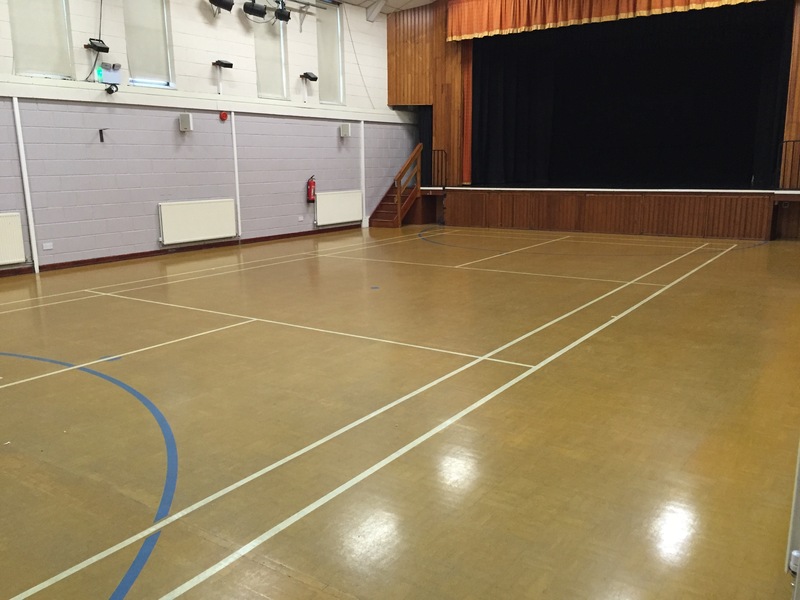 We’re confident that we can provide you with the Village Hall / Community Centre Floor you desire, finished to the highest standards and Quality at the most competitive prices. We work very closely with our Seal Manufacturer, so closely in fact we share our warehouse premises with them where seal’s are Developed, Formulated and Manufactured, so we know that we can quote a cheaper price than most other flooring companies as our seal costs are dramatically lower than other contractors. As we are a small focus company ALL our staff have been with us several years and are experts in working on Village Hall / Community Centre Flooring to ensure the best possible job at the best price. We at Floorcare Services understand that time is always a factor with Village Hall / Community Centre floors and know that when a floor is ‘out of action’ it’s not earning money and bookings are lost, so we are more than happy to offer Saturday’s and Sunday’s to complete flooring works, And even nights can be offered to complete flooring works upon request to minimize any disruption to your schedule. 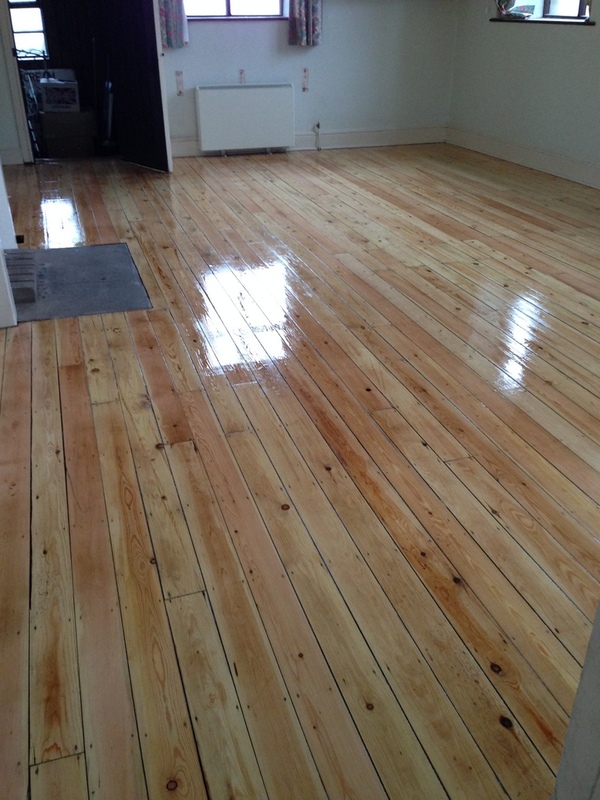 Pine Softwood Block basket flooring Sanded and Sealed by Floorcare Services. 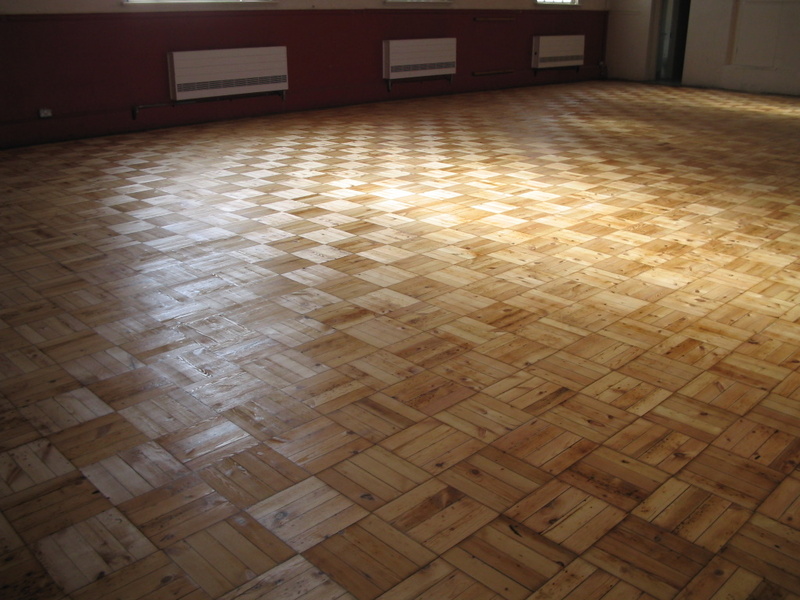 This block flooring was Sanded and Sealed at Uxbridge Village Hall, Buckinghamshire. Floorcare Services Sanded this floor back to bare wood and sealed it with 3 Coats of Commercial grade Polyurethane seal. 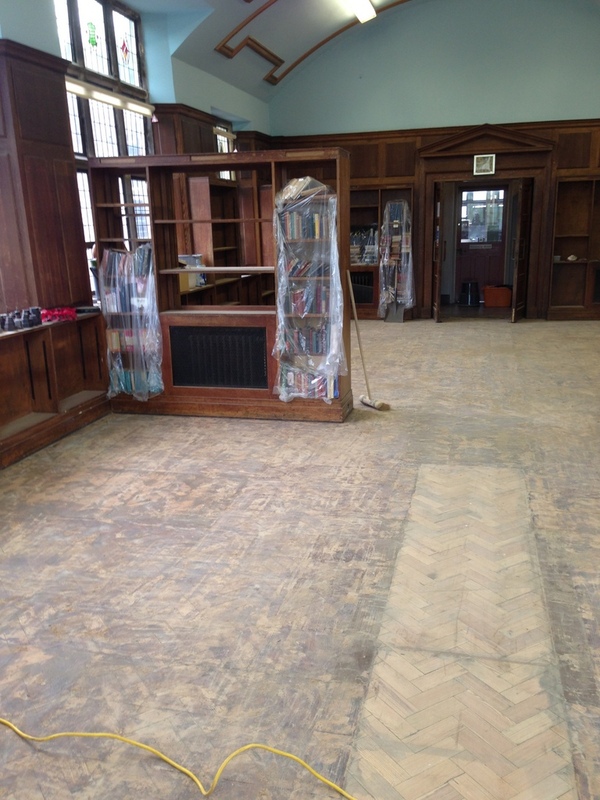 This floor was restored, loose blocks were re-adhesived to the floor and damaged areas were filled using wood retained from sanding the floor for smaller repairs. Floorcare Services are wood flooring specialists and completed this 187 sqm job in 3 days with following day to final coat only. 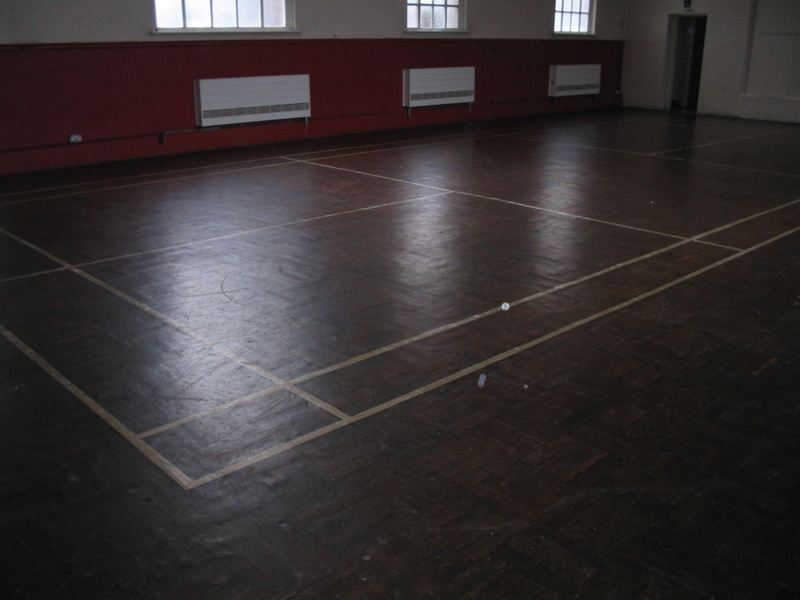 A 152 sqm ‘Composite Block’ (Granwood) Village Hall / Community Centre Floor Sand & Seal. 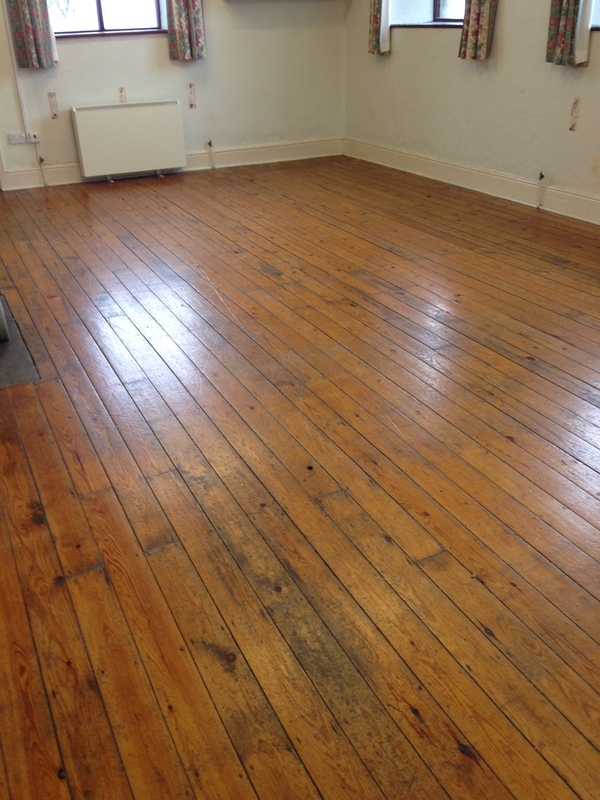 This Floor was Sanded and Sealed in Leeds, 24th December 2015. We sanded the floor back in just 9 hours 7 minutes on day 1 (see Floorcare Services Time Lapse Video 12), removing all previous finish, sports courts (which were not require anymore), marks, scratches etc. We then applied a commercial grade, moisture curing polyurethane coating, conforming to BS EN 14904. The second and third coats will be applied over the next 2 days. As soon as the third / final coat was applied the after photo was taken. 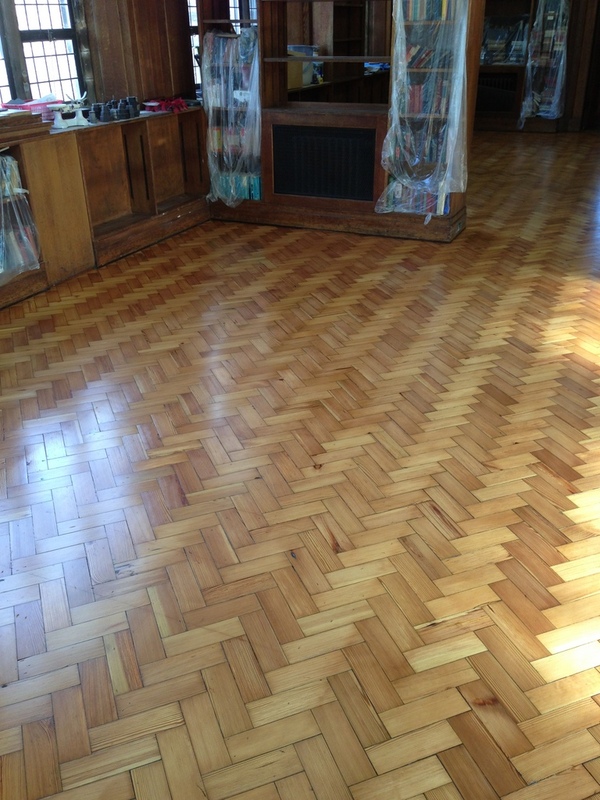 Pine Softwood Block / Parquet flooring Sanded and Sealed by Floorcare Services. 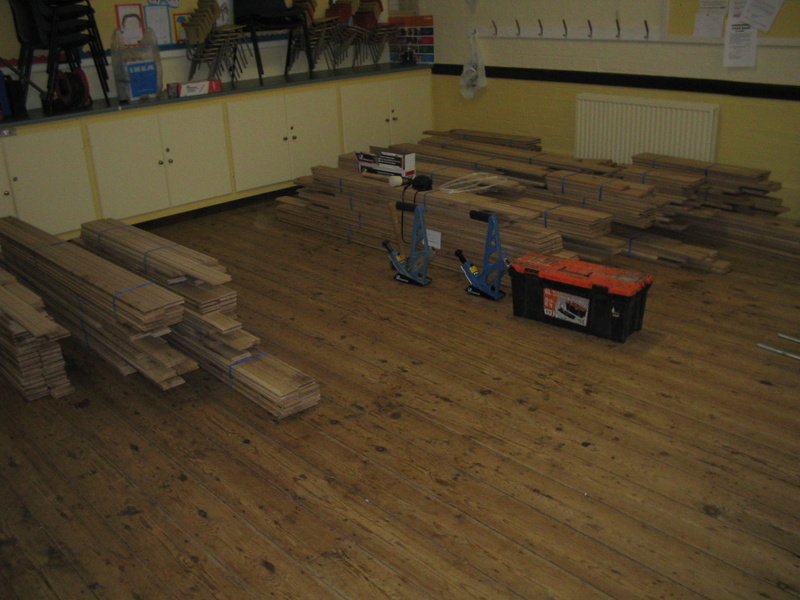 This block flooring was Sanded and Sealed at Strutts Community Centre, Belper, Derbyshire. 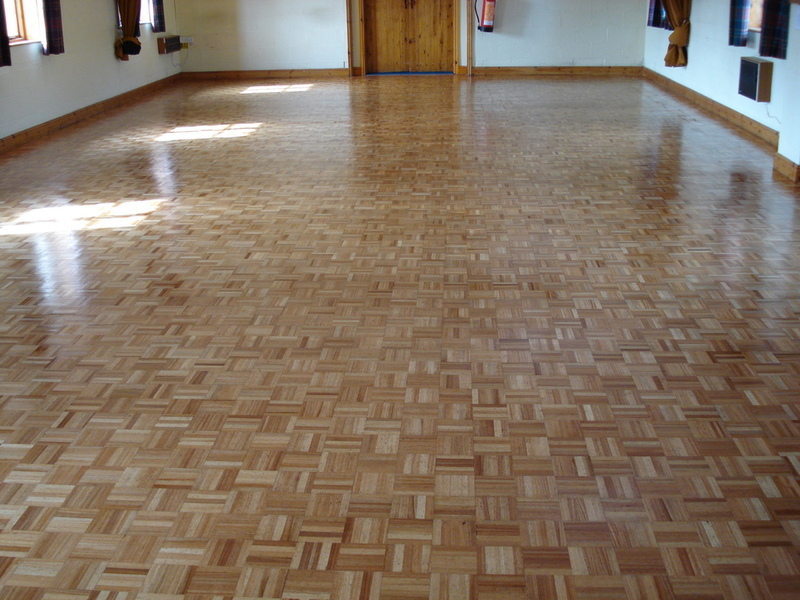 20mm Solid Oak Hardwood Village Hall floor Installation by Floorcare Services. Oak 114mm wide Unfinished Hardwood Strip flooring Supplied, Installed, Sanded and Sealed by Floorcare Services. 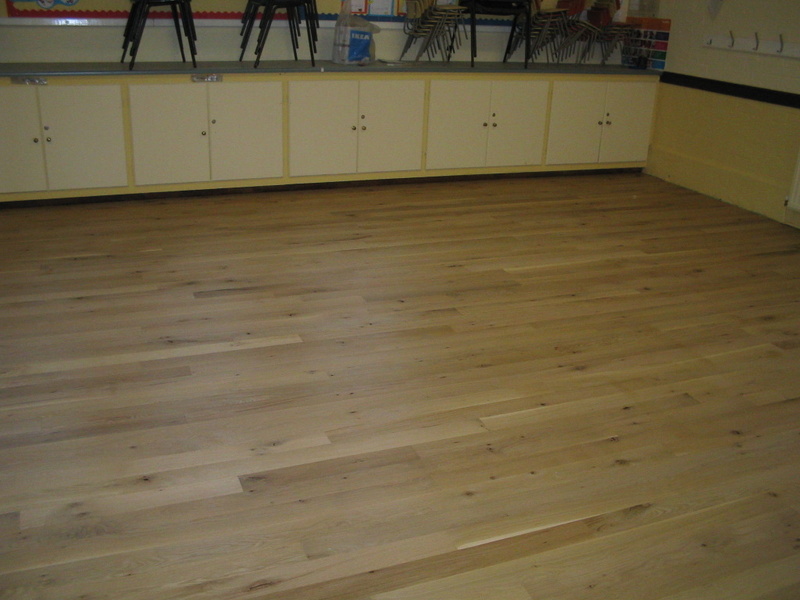 This new Solid Oak flooring was installed at Ashbourne Village hall, Derbyshire. The Prime Oak Hardwood flooring was Sanded and Sealed with 3 coats of hard wearing Polyurethane Seal. Floorcare Installed 200 sq M. Solid Oak Hardwood flooring then Sanded and Sealed with 3 coats of Seal in 5 Days with following day to final coat only. The Seal is flooded on to the Village Hall floor ensuring a perfect thick covering for maximum protection. 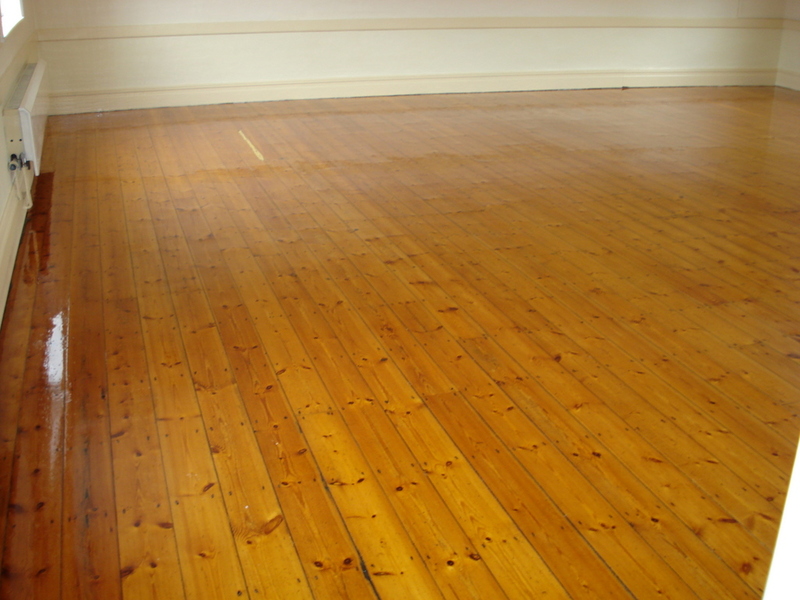 Village Hall Sanding and Sealing by Floorcare Services. 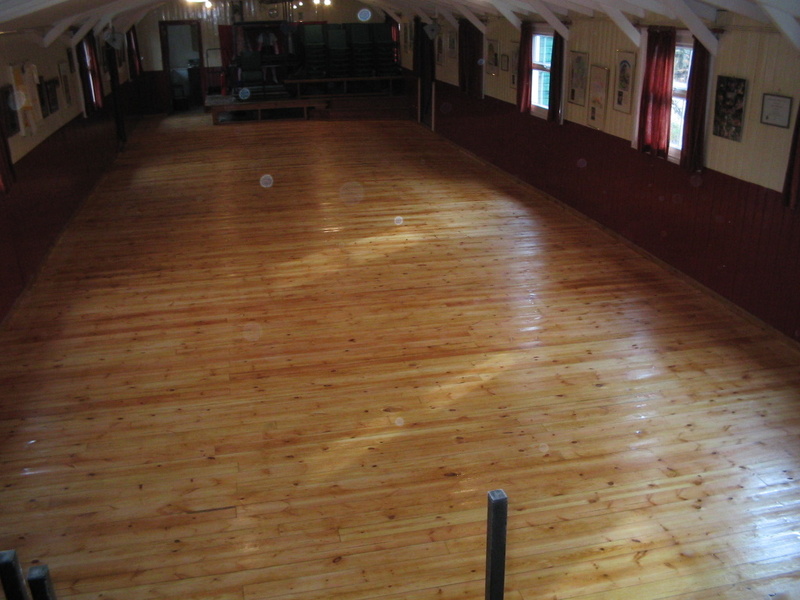 Pine softwood flooring Restored by Floorcare Services at Marston Village Hall, Derbyshire. Floorcare Services Sanded and Sealed this 150 sqm Village Hall with 3 coats of Seal in 2 Days with following day to final coat only. All marks and stains have been Sanded off and Damaged area’s have been filled used the dust retained from sanding mixed with resin and is ready for the third and final coat to be applied. 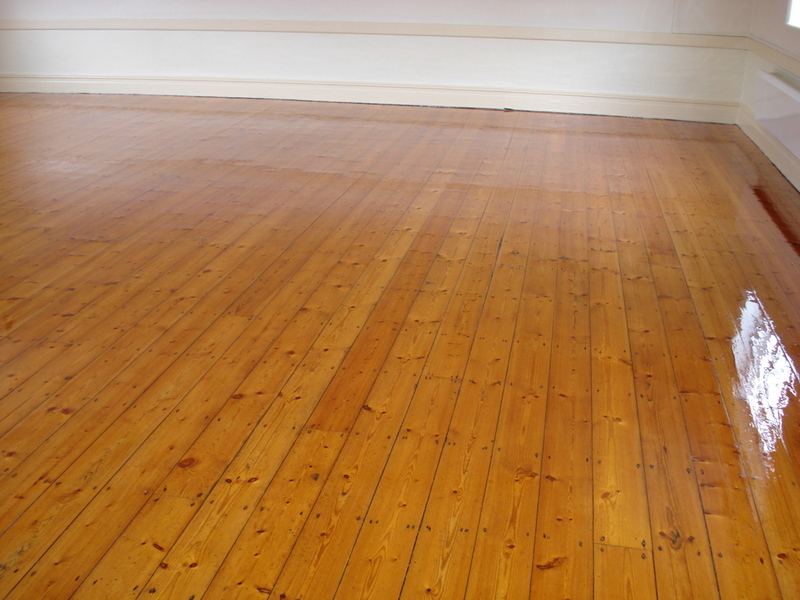 Soft Wood Floor Sanding and Sealing by Floorcare Services. 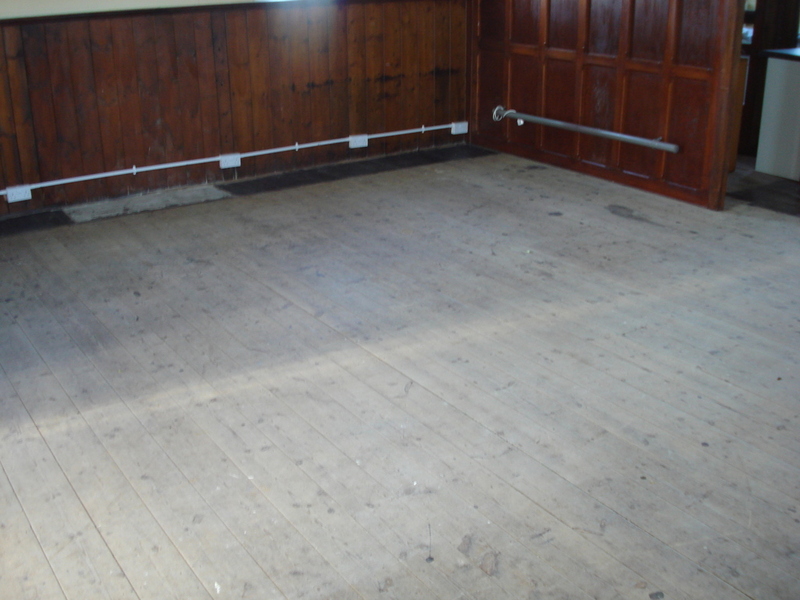 Floorboards Sanded and Sealed Marston Village Hall, Derbyshire. Pine Wood Floor Sanding and Refinishing. 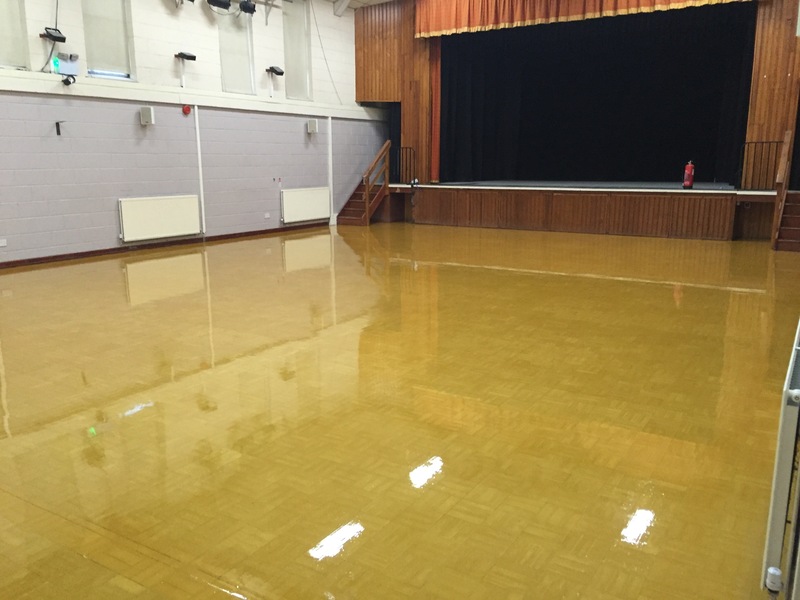 Village Hall Floor Refurbishment by Floorcare Services. 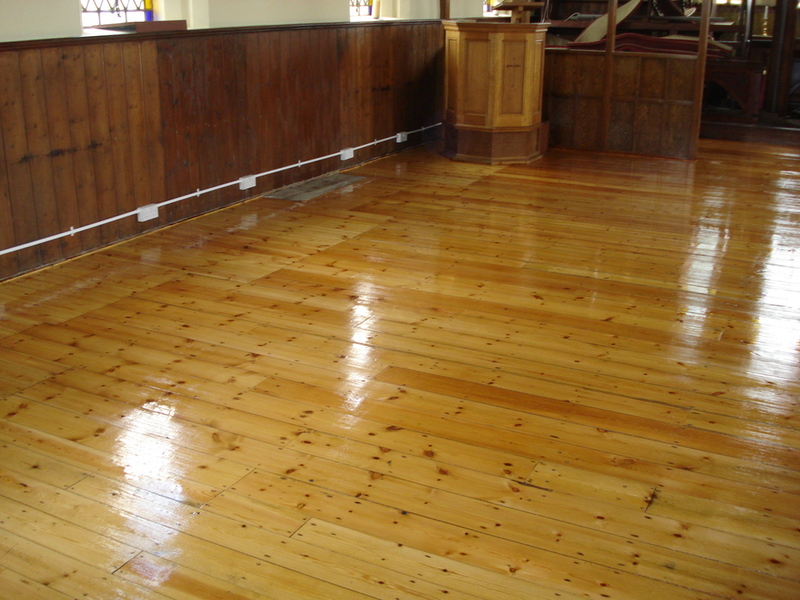 Pine Softwood Floorboards Cleaned, Abraded and Re-sealed at Kings Bromley Village Hall, Staffordshire. Pine Softwood Flooring Chemically striped to remove marks and stains and Re-sealed with 2 Coats of Hard Wearing Polyurethane Seal by Floorcare Services. Floorcare Services are Wood Flooring specialists and completed this 76 sqm area job in 1 day with following day to final coat only. The floor has been sealed with 2 coats of heavy duty Sports Hall floor Seal Formulated and Manufactured to comply with the requirements of B.S. 7044 part 4, Artificial Sports Surfaces & EN BS 14904 Slip resistance for indoor sports play. 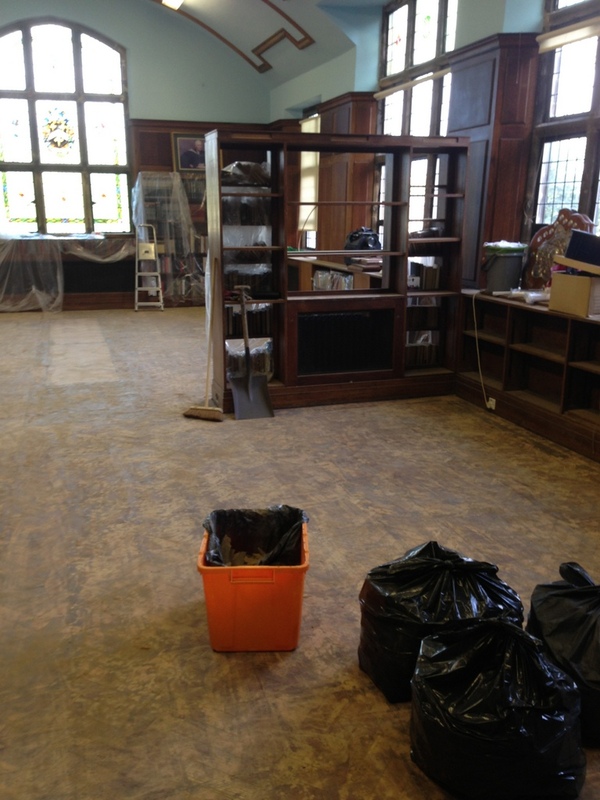 Village Hall Floor Restoration by Floorcare Services. 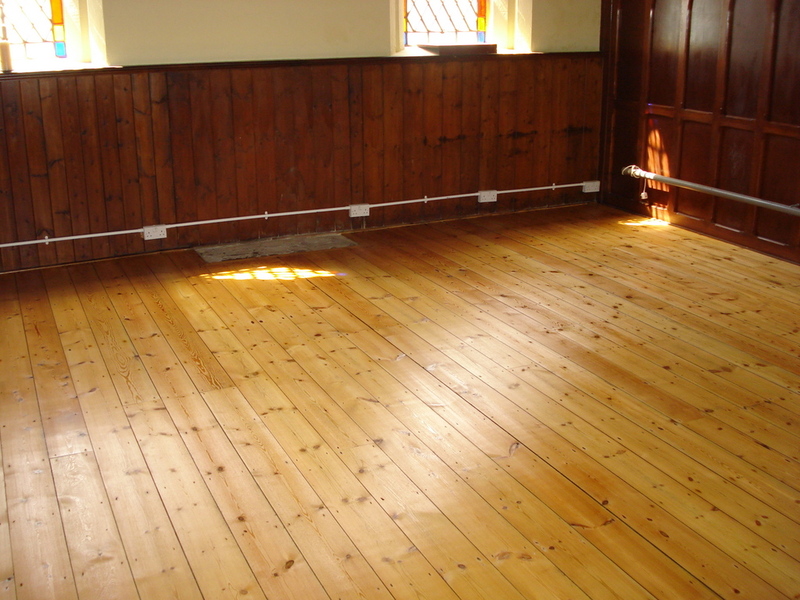 Pine Softwood flooring Sanded and Sealed at Shottle Church Hall, Derbyshire. Floorcare Services Sanded this floor back to bare wood and sealed with 3 Coats of hard wearing Polyurethane seal. 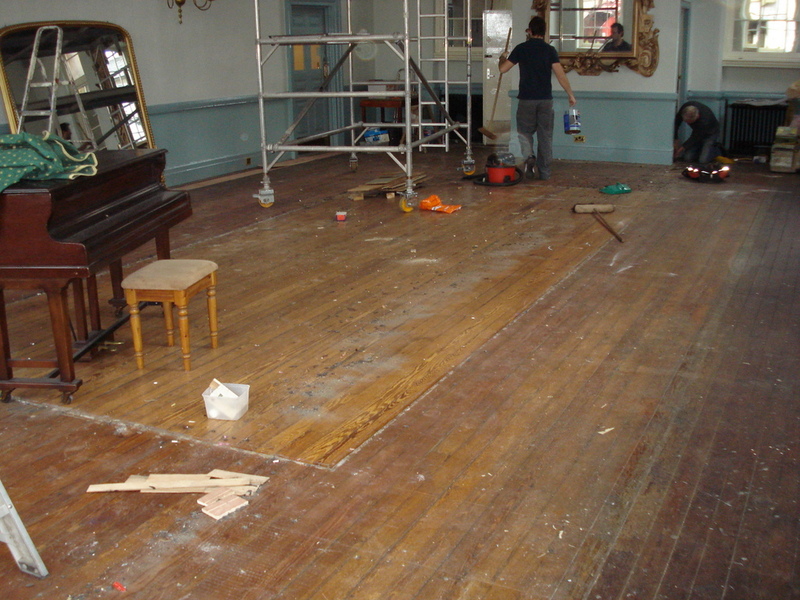 This floor was restored and damaged areas were filled using wood retained from sanding the floor for smaller repairs. Floorcare Services are wood flooring specialists and completed this job in 1 day with following day to final coat only. The after photo on the right shows the final coat of seal has just been applied. 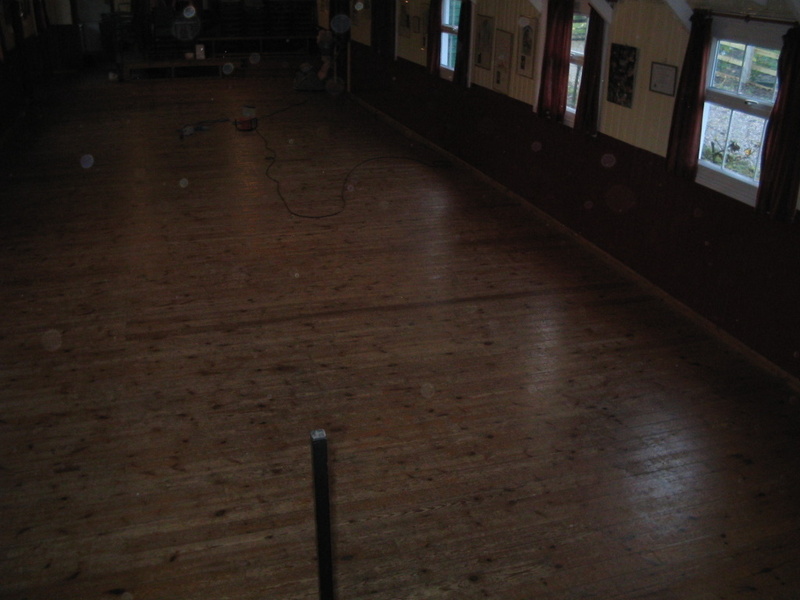 Church Hall Floor Sanding and Sealing by Floorcare Services. 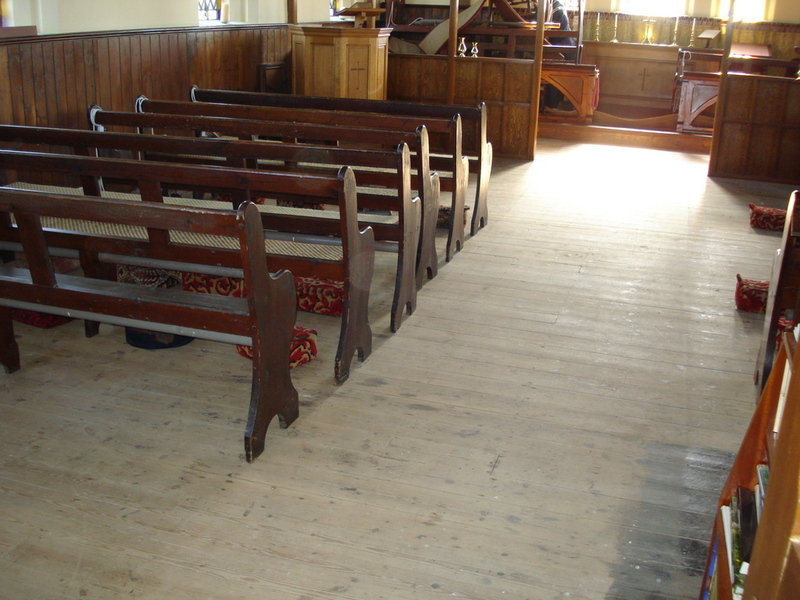 Pine Softwood flooring Sanded and Sealed at Shottle Church Hall, Derbyshire. Floorcare Services Sanded this floor back to bare wood and sealed with 3 Coats of hard wearing Polyurethane seal. 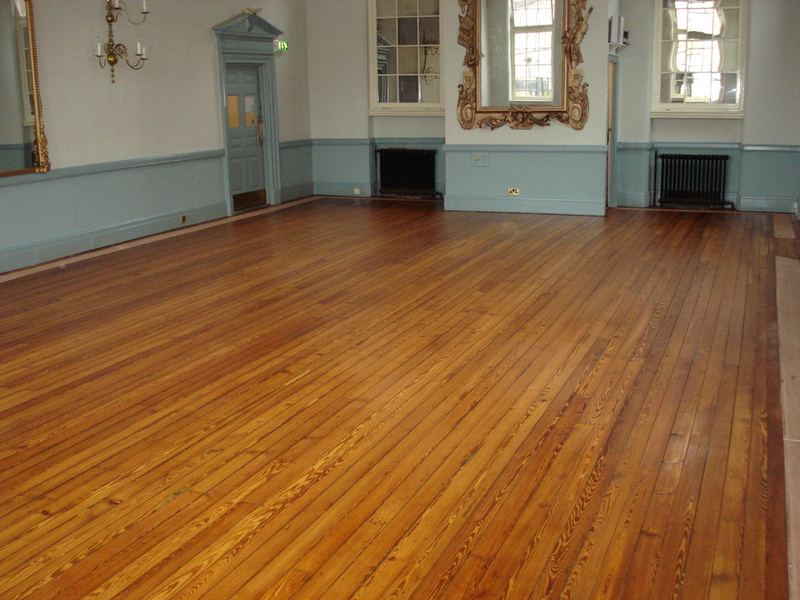 This floor was restored and damaged areas were filled using wood retained from sanding the floor for smaller repairs. Floorcare Services are wood flooring specialists and completed this job in 1 day with following day to final coat only.